The Hull-Zeebrugge ferry route is good value, and super-convenient for the pre-eminent Zoute Grand Prix classic car show, and the N57 Delta Works causeway road. P&O’s Pride of Bruges, docked in Hull. All photos by @DriveEurope, more below + map. Hull is not the most glamorous departure point for a Continental driving holiday. From a practical point of view however it’s very handy, half-way up the English east coast and well served by the M1, A1(M), M62 and M180 (via the spectacular Humber Suspension Bridge). The only inconvenience is that the port is on the east side of town. Most passengers will have to drive across the city, a stress at rush hour. 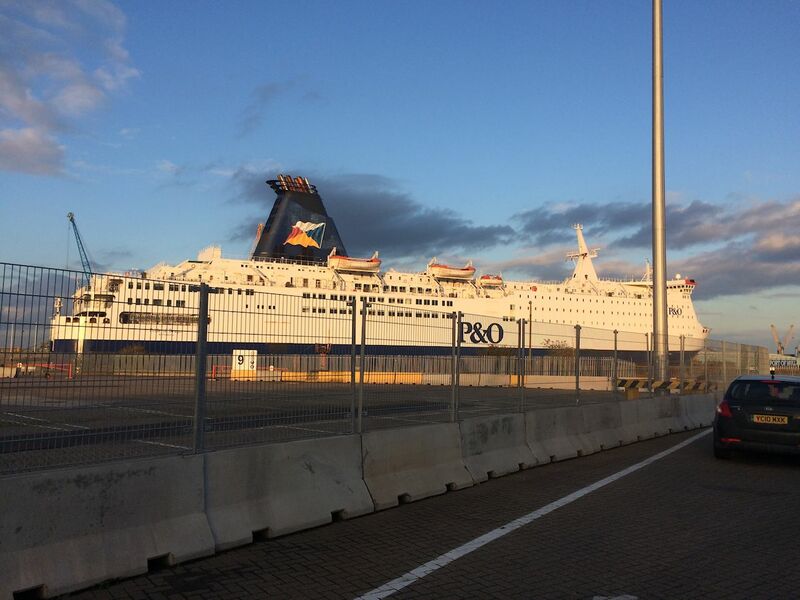 P&O is the only ferry operator to use Hull, to Rotterdam in Holland or Zeebrugge in Belgium – a few miles from the Dutch border – all departing, either way, in the evening. They like you to be there ninety minutes before the ship leaves. We chose Zeebrugge because we wanted to check out nearby Knokke-Heist – the swish resort town which hosts Belgium’s Pebble Beach-style ‘Zoute Grand Prix’ classic car show – and drive up the Dutch coast on the N57 causeway road. For an overnighter it is shockingly cheap. We paid £181 all-in, including an outside ‘premier’ cabin. That compares well with the hundreds and hundreds and hundreds of pounds we’re used to paying for long haul boats though it might be something to do with the North Sea; Stena Line’s similarly overnight Harwich-Hook of Holland is not much more expensive. That said, the Pride of Bruges is not as luxurious as other ‘cruise ferries’ we’ve tried. The cabin and ensuite were spotlessly clean but quite basic: the beds were bunks, the top one a heavy fold down. We’d been warned beforehand about the potential for a rough crossing, because of the regular stag and hen groups, and the weather. This Monday night in late October there were no raucous parties. The weather however was another matter with Force 8-9 gales and rough seas forecast. One of the pleasures of overnight crossings is dinner in a proper restaurant, a great way to mark either the start or the end of a holiday. Our plan was to have a few drinks and something to eat early on in the expectation of a disturbed night’s sleep. PoBruges’ disposable-napkin’d The Brasserie is not quite up there with the best we’ve seen – the generous slab of ‘line caught’ tuna was however well cooked – but it was reasonable value: £75.70 for three courses, two G&T’s and a bottle of Prosecco. The staff were exclusively Asian, not a problem per se – the service was spot on – but you must wonder about their pay and conditions. In the event we both had a great night’s sleep. Apart from a brief spell of rhythmic rocking and rolling at three o’clock in the morning the gale force winds passed by unnoticed. It’s not clear whether that’s because we both have naturally sturdy sea-legs, the PoBruge can easily cope with that kind of weather, or the winds didn’t turn up quite as expected. Whatever, the decks were absolutely soaking wet the next morning as we cruised into Zeebrugge watching CMA CGM’s 130,000t Gemini unloading some of its 11,500 shipping containers, just arrived from China and Malaysia. 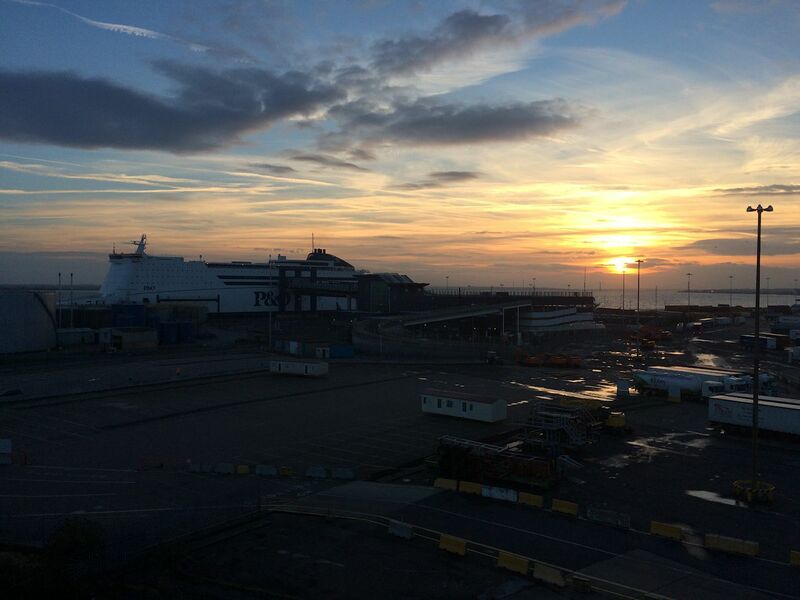 Zeebrugge – as in Bruges on Sea – is Europe’s twelfth largest container port but the world’s biggest import/export terminal for new cars with nearly two million shifted in 2013. Disappointingly, that all takes places in the inner harbour area far out of view. The dual carriageway E34 expressway runs right outside the gates for an easy connection via Bruges to the major E40 Brussels motorway. From 2017 a new stretch of the A11 opens to the south side of the inner port to bleed away commercial traffic, and improve access for tourists to what is a prime stretch of Belgian coastline. We head east, almost immediately into Knokke Heist. You’ll have to take our word for it – by this point the weather was too bad for photos – but it’s easy to see why the owners of priceless classic cars feel comfortable around here. Sleek, expensive-looking apartment blocks line the road, a few yards from the seafront, not a burger joint or fruit machine in sight. From there it’s just a couple of miles on simple, tree-lined country roads to the Dutch border. Hull: P&O’s Rotterdam boat leaves from a separate berth. 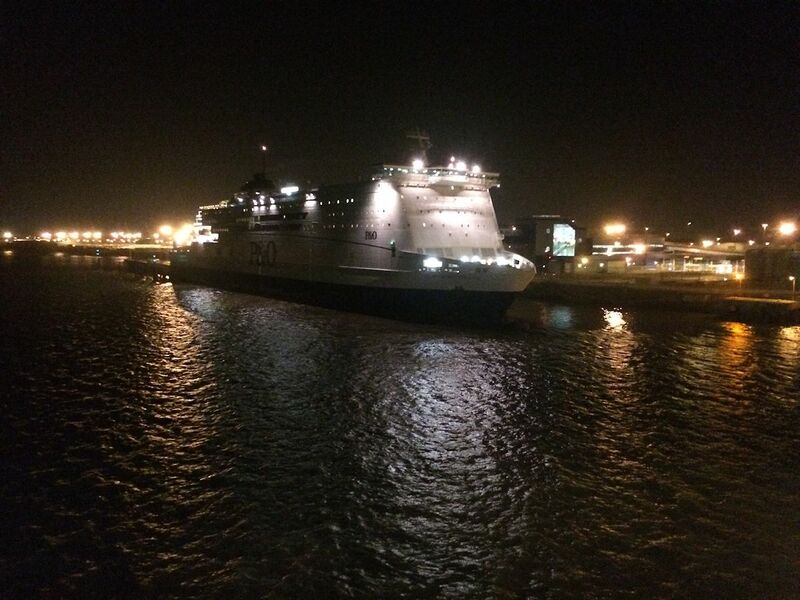 Both leave in the evening, Rotterdam at 20:30 (21:00 on the return) and Zeebrugge at 18:30 (19:00). Latest check-in is officially ninety minutes before departure but we were a bit late and they still let us on. 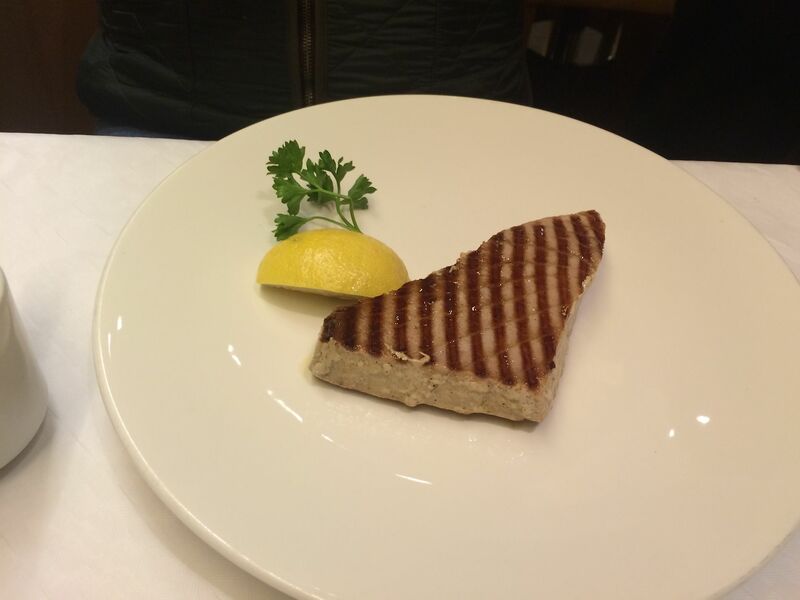 It was a generous and well-cooked slab of ‘line caught’ tuna served in Pride of Bruges’ The Brasserie restaurant. A peculiarity of Port of Hull is the tidal barrier which closes at unexpectedly high tides and can cause delays. That – plus a medical emergency – meant we were nearly an hour late leaving but it made no difference to our arrival time the next morning. 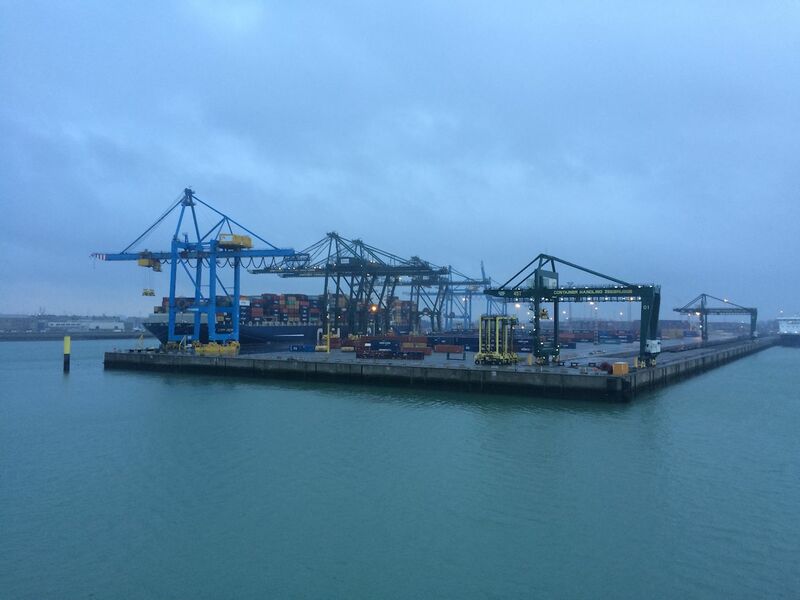 The custom quay used by French shipping giant CMA CGM to unload its enormous container ships. Gemini holds 11,500 standard containers compared to Maersk Line’s Emma class ships – the world’s biggest – which can carry 18,500. 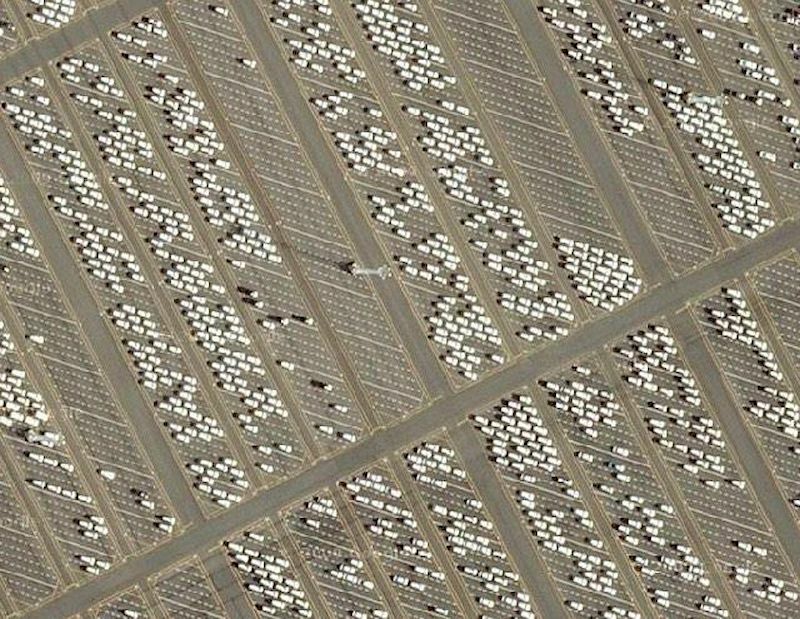 A Google Maps’ view of the vast car import/export terminal in the inner harbour, Zeebrugge, the world’s biggest. Heading inland, cross-country from Zeebrugge into Holland on the N253 via Sluis and Oostborg. 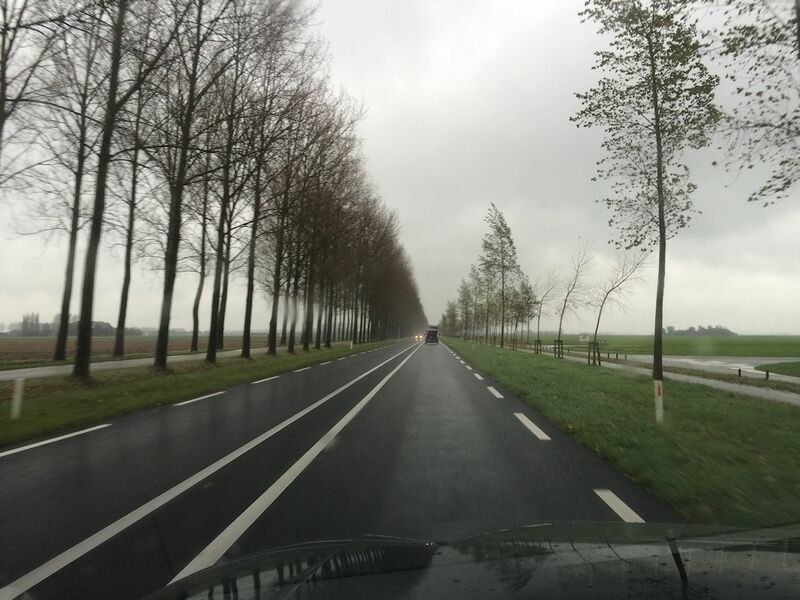 It’s around thirty miles to the N62 Westerschelde Tunnel onto the Zeeland Peninsula – toll €5 – and another twenty five miles to the N57 causeway road which island hops up the southern Dutch coast along the massive Delta Works flood defences. See here for more information of P&O Hull-Zeebrugge.